Las Vegas is in the house! Or, should I say, the Sinatra Living house from the University of Nevada, Las Vegas team is on site! 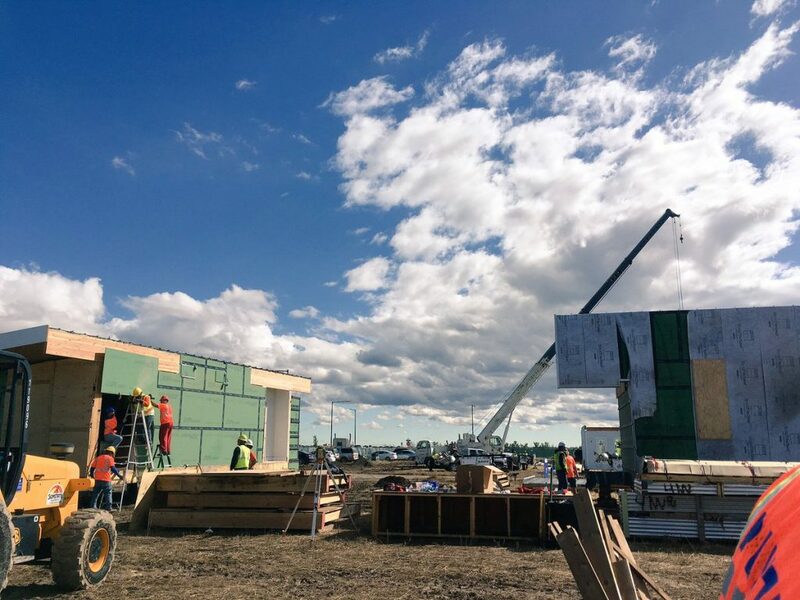 The team’s mechanical pod had arrived, along with a lot of decking material, and students were busy prepping the team’s “lot” in anticipation of their house arriving. Around 1:30 p.m. the semi-truck hauled in the house on its integrated trailer to much cheer. Then it began to contend with the mud. I lost track of all the bales of straw a team member threw into place to give traction to the truck’s tires as it worked to put the house into place. Despite the late arrival of the house, student Team Leader Nasko Balaktchiev, is feeling positive about the team’s chances of finishing on time, because much of the house’s interior is already finished. Wet weather is no stranger to Team Daytona Beach. This is the team that had to sit out construction for several days when their schools shut down because of Hurricane Irma. That meant they arrived at the competition site without having completed construction of BEACH House. During transit, the tarps ripped, causing the house’s subfloor and some drywall to sustain water damage. Student Team Leader Jenna Beckwith says the team is working to get things dried out and will keep plugging away. They’ve had some volunteer help from area professional associations, and, best of all, another team! The team from Missouri University of Science and Technology is actually ahead of schedule, so rather than take a break, they kept their hard hats, work boots, and other safety gear on and walked “down the street” to help their neighbors at the opposite end of the village. 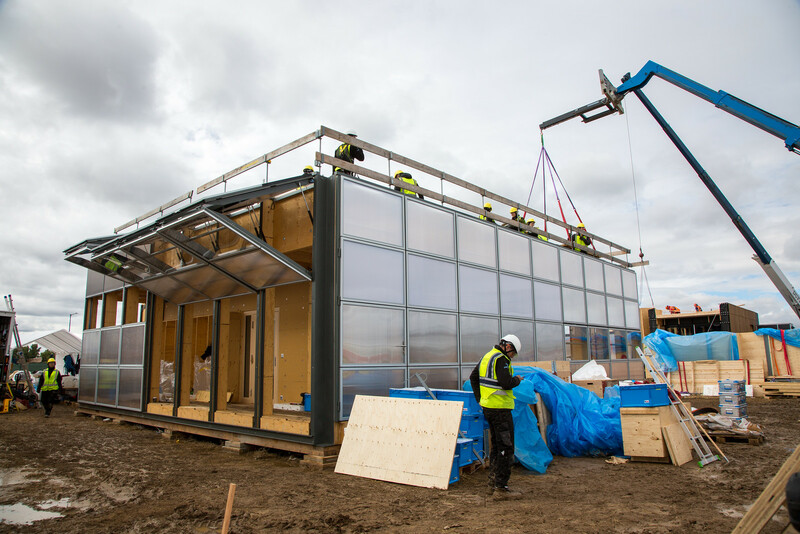 Now, that’s the true spirit of Solar Decathlon! 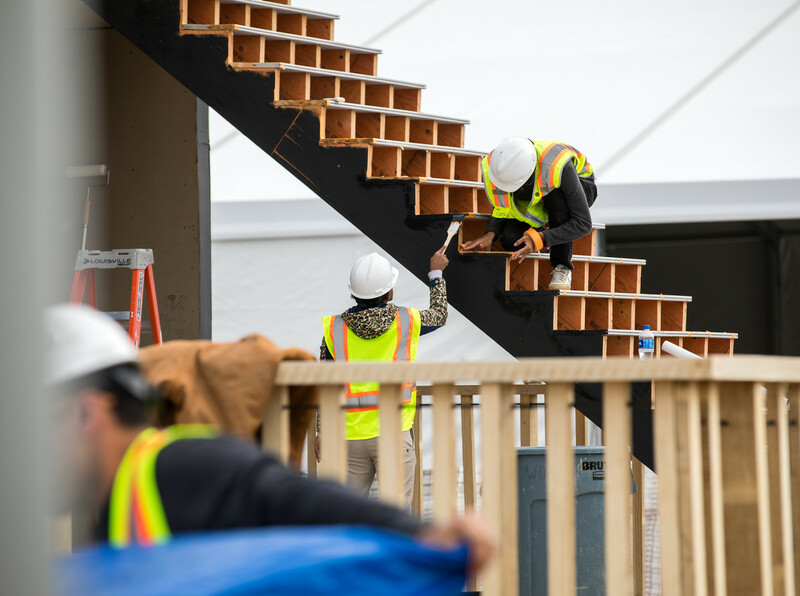 A stroll through the rest of the Solar Decathlon village offers some additional updates. Crete House, from Washington University – St. Louis, has come a long way since Monday, when they were craning walls into place. Today they have walls and a roof, and they’re working hard on decking, access ramps, and the interior. Team Alabama’s surviv(al) house, which saw delays in transit, is weathered in and their solar panels are up! They’re also hard at work on decking and the interior. Enable by Northwestern is coming along. Today they are working on roofing, siding, weather sealing (the irony! ), and, making a rare appearance at Solar Decathlon, a garage! RISE by the University of California, Berkeley and University of Denver team is indeed rising! There are stairs up to the rooftop deck, where full railing is also being installed. They’re also painting on both the interior and exterior. The University of Maryland team has grown in size. The team is working in two shifts of about eight students each. They are working on the interior of their house, called reACT, as well as weather sealing windows and, very exciting, putting in their greenhouse. UC Davis’ OURH2Ouse is fully set and leveled. 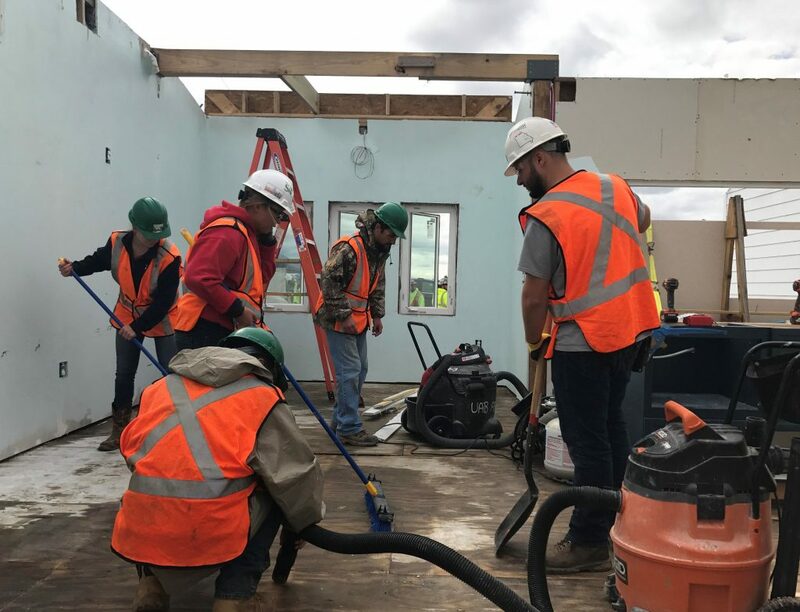 Today they’re working on windows, siding, and decking as well as some intriguing exterior finishes, including a deck roof trellis made of bicycle wheels—a fitting touch for the school from Davis, California, a famously bicycle-friendly city. The team from The Netherlands is working on the noble-wood siding for their house, Selficient, and integrating their mechanical core. The Swiss Team has come a long way since Monday. Today they’re working on their rooftop green space and their solar energy systems. They’ve added a lot of the translucent siding, which appears to be unique to the NeighborHub. When I visited Missouri S&T’s SILO house today, their kitchen looked so finished, I asked if they could cook me some lunch. Not quite! (But they did offer me some snacks.) Last night when we had photographers on site to add photos to our Event Photo library, they noted Missouri S&T was dark. That’s because the team’s ahead of schedule and leaves the site to go back to their hotel early. Or, as mentioned earlier, they walk on down the street and lend a helping hand to their neighbor in true Solar Decathlon style. This entry was posted on Thursday, September 28th, 2017 at 6:11 pm and is filed under Competition, Las Vegas, Maryland, Missouri S&T, Netherlands, Northwestern, Solar Decathlon, Swiss Team, Team Alabama, UC Davis.